KSC Clear Polycarbonate Sheets are virtually unbreakable. Extruded from UVA stabilized polycarbonate resin. These polycarbonate plastic sheets have high impact strength yet are about one third lighter than Plexiglass and about one sixth the weight of glass. Light transmission about 89%. Suitable for both internal and external glazing projects. Great choice for security protection. 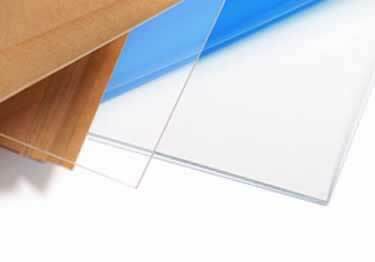 Thicknesses available: 1/16", 1/8", 3/16", 1/4", 1/2"
Polycarbonate which is Lexan, and is sometimes used as bullet-proof glass. Although it is more shatter-resistant, it is more expensive than acrylic, yellows with prolonged exposure to sunlight, and is much more easily scratched. Therefore acrylic is more ideal for most interior and exterior design purposes. Acrylic (polyacrylate) is marketed under many trade names including Plexiglas, Lucite, Perspex, Policril, Gavrieli, Vitroflex, Limacryl, R-Cast, Per-Clax, Plazcryl, Acrylex, Acrylite, Acrylplast, Altuglas, Polycast, Oroglass, Optix. We recommend using drill bits safe for plastic sheets. How do you attach these to the walls? I use a power wheelchair and have to exit my home via a narrow hallway with a hard left turn. The walls have gotten badly scuffed, scratched and gouged from repeated encounters with my chair as I navigate this tight space. Would you recommend the polycarbonate or clear acrylic to protect the drywall? What thickness? Can I get samples? I tried using a sheet of 1/8" thick Sintra sign board (a kind of PVC plastic), and it cracked where my caster wheels hit it during the turn. I do dog grooming and will be installing a tub in my garage, I am looking for a product to protect the drywall from getting wet; would you recommend the polycarbonate or clear acrylic for this purpose? I have the clear polycarbonate wall panels and the drill bit you sent but what type of screws do you recommend for putting the panels over painted drywall? Hi Robert, Thank you for your question. You can use any screws you would like, it's totally your choice. Just make sure you don't over tighten so not to crack the Polycarbonate. How can you clean your clear polycarbonate wall panels? These have a special tip design for carving through plastics without damaging the plastic sheet. Available in 8 sizes. Re-usable, designed & manufactured to provide the ultimate edge protection for high traffic areas. High impact cardboard. Great plastic sheet cutting tools including: saw blades & sabre saw blades. We can help you get the job done!